The chase after individual ‘heroes’ in order to solve the country’s problems was futile, as this column had earlier stated. It is necessary to seek suitable rational policies instead. However, last week we demonstrated that the policies practised by all post-independence governments have failed. Hence, there is also a need for new policies. It is also obvious that we need new political actors, which does not necessarily mean new political parties. It is up to the civil society to facilitate this change. The civil society needs to awaken itself from the deep slumber. 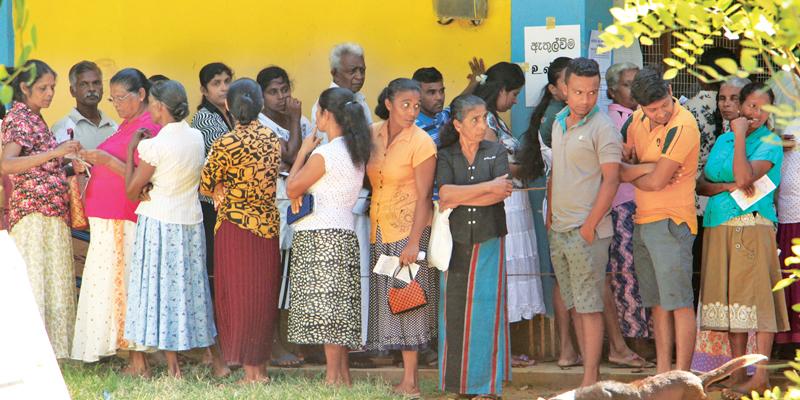 Sri Lankan civil society passes through spasms, becoming generally active on the eve of elections and vice versa. There is much to be desired in its organisation. Just as in politics in general, it also shows a tendency to rally round individual leaders. However, the role of leaders cannot be denied or under-valued. They are necessary but they could lead only insofar as they represent the interests of the masses as such. Exaggerating their role or deifying them as per tradition or otherwise leads to unwholesome developments including curtailment of democracy. Excepting for political parties and their affiliated front organisations, trade unions and professional bodies and few religious associations most other civil society organisations tend to be elitist and basically undemocratic. Some do not even enroll members, the organisation being limited to a coterie of leaders and their ‘yes men’. Most NGOs also belong to this category despite the massive resources at the command of some of them. However, there are numerous civil society organisations with an organisational basis at the local level. They are dispersed and are exclusive in nature. There are no moves for any coordination among them as they are so diverse and so dispersed. In this situation how could civil society play its vital role in pushing the country on a new path of independent development? This is the question that warrants an answer. From the above it would be obvious that what are required are civil society organisations with a mass democratic character. To be such they should be based on rational democratic principles which could guarantee freedom, equity, equality and fraternity among all citizens. As often said we have been unable to cement a Sri Lankan identity. Instead communal and even religious differences continue to divide us. Diversity which should be a source of strength has been transformed into cause for separation. Of late ethno-religious fundamentalism or groups promoting Sinhala-Buddhist hegemony are on the rise. This is despite all religions preaching universal brotherhood of man or maha karuna. Hence, what is required is a secular civil movement or a socio-economic movement based on secularism. Only such an organisation would be all inclusive. Rule of Law is a sine qua non for development. Corruption and fraud would thrive in a society devoid of the rule of law. The failure of the Yahapalana Government in bringing to justice those who were alleged to have been involved in massive acts of fraud and deception can be attributed to the breakdown of the rule of law. Even the judiciary is not free from suspicion in this environment. What is more despicable is a new tendency in which interested parties are agitating to get laws repealed or prevent new laws being formulated for crimes they are likely to commit. An example is the agitation against the revision of traffic fines. Surreptitious and not-so surreptitious moves are afoot to reduce the powers of the State judicial authorities and exempt them from adjudicating in cases where the accused are members of the Buddhist clergy. It is imperative that any movement for socio-economic change should uphold and defend the rule of law. Governments have been always shown a tendency to ignore or shoot down public opinion. The obstinacy with which the Western Provincial Council insists on importing chairs at Rs 650,000 each is a case in point. Numerous are the instances in which even the Parliament is faced with fait accompli in various commercial undertakings. e.g. The SL-Singapore FTA. Hence, another vital principle that should be adhered to is transparency of dealings. This is especially so since all public officials and representatives should be held accountable. On the economic front Sri Lanka should naturally opt for a mixed economy. Being a small country with a narrow market it is imperative that it produces goods and services for the wider international market. Foreign direct investment likewise is necessary. The latter should be conditional on the requirements of the economy. The practice of approving unsolicited proposals or those with environmental concerns should be abandoned. Agriculture should receive prioritize attention in economic planning and development. Sri Lanka could abandon its traditional commercial crops - tea, rubber and coconut at its own peril. It is necessary to develop both commercial and subsistence agriculture down the value chain without abandoning them half-way. Moreover, FDI should be engaged mainly for production oriented industrial and agricultural development rather than costly and less productive infrastructural improvements. Whatever economic reform that a new social movement should guarantee it must in the main benefit the poor and under-privileged masses. Though the neo-liberal economic reforms promised that its benefits would trickle down to the bottom it did not happen and is unlikely to happen. Hence, what are required are pro-poor reforms or reforms that guarantee a decent living to the masses. It is true that such development may require tightening belts and reduction of wasteful expenditure including the luxury and opulence of the rich. In a society in which the rich and the poor are polarized in the extreme, it is not enough to tighten the screws at the poor pole alone. Sri Lanka has to charter its own path to independent development. There are no short-cuts or ready-made foreign models to replicate. That means the Singapore model, among others is an utopian dream. The same goes for replicating Korea, Japan or China. Sri Lanka has both physical and human resources for such a venture. In order to log on to the path of independent development national unity, creative thinking and innovation have to be assembled.